I walked out of the bathroom, and came face to face with a spider abseiling down from the ceiling. I've been reading Neil Gaiman's "Fragile Things" until far too late (about 10 minutes ago, in fact) and it is brilliant and creepy, and "The Problem with Susan" had got inside my head, and was making me feel young (yeah right) and vulnerable and not at all someone who should be alone in a dark house with two small children. The spider surprised me and for a second I panicked. I went into the kitchen to get a glass and I captured the spider as it tried to reel itself back by bringing the glass up under it and cutting off the strand of web with a 'football party' invitation (J's birthday was yesterday. He is 3 now). I looked at my spider through the glass. It was beige and brown, a caricature of a spider with eyes on stalks and delicate stripey legs, the front pair longer than the other six. It was beautiful. I let it go outside in the darkness, feeling safer. J, who is unhinged by his father coming back to NZ after 10 weeks in the UK (as, I guess, am I), said to me this morning "I'm feeling fragile". It's scary being responsible for such precious fragile things (especially when I'm as tired as I will be tomorrow). After lunch I said, "Okay T, say goodbye to your Kauri friends now", and he flopped his hand up and down several times. I wasn't sure, but I handed him to a Kowhai teacher saying "Bye T, Mummy's going back to work now" and he did it again... He's so clever! 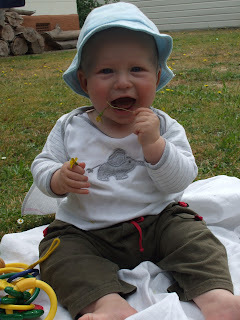 ... And he has his 1st tooth as well (or at least the 1st wee sharp bit through his gum).